Our first year at Orasella, we produced just a handful of quart jars, all lovingly crafted by hand. This initial batch found a home at some of the best restaurants in Seattle where we were constantly delighted by the creative ways they were put to use. We discovered, through working with these talented chefs, that our cherries pair incredibly well with all manner of soft cheese – from goat to house made ricotta. We know you’ve probably tasted the New York style cream cheese based cheesecake, but, did you know there’s a whole suite of soft cheese cheesecakes to explore? Orasella’s version is made with mascarpone which, in addition to being Italian (swoon), has a slightly tangier flavor that pairs perfectly with the sweetness of our cherries. Buon appetito! Preheat oven to 350 degrees. Butter the sides of a 10-inch springform pan. Wrap exterior of pan (including base) in a double layer of extra wide foil. This is so the water won’t creep in when you cook the filling. Melt 6 tablespoons butter in a small saucepan over medium heat. Place crushed wafer cookies and 3 tablespoons sugar in a large bowl; stir until well combined. Pour melted butter over cookie mixture and mix until evenly moistened. Press mixture evenly into the bottom of the prepared pan. Place pan on a baking sheet. Bake until crust is set, 10 to 12 minutes. Transfer pan to a wire rack to cool completely. Decrease oven temperature to 325 degrees. Using an electric mixer, beat the mascarpone cheese, cream cheese, and sugar in a large bowl until smooth, occasionally scraping down the sides of the bowl with a rubber spatula. Beat in the lemon juice and vanilla. Add the eggs, 1 at a time, beating just until blended after each addition. 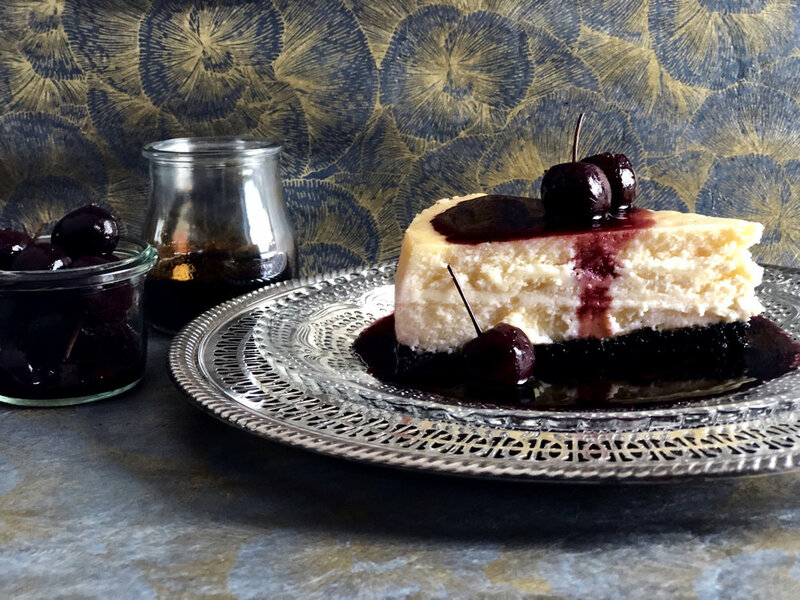 To serve, cut a piece of cheesecake and serve topped with Orasella cherries and a drizzle of the remaining syrup in the jar. For a more professional look, reduce syrup by half in a pan over medium heat. Cherry coke brings about memories of childhood, hot summer days and playing Marco Polo with the 6 new friends you just met at the community pool. This evolved version gives the classic cherry coke just enough of an upgrade to have you pining for the grown up version of the same scenario, hot summer days around a fire pit swapping stories with six of your best friends. Cheers to the onset of warmer weather. Vigorously shake rum, Fernet Branca, cola syrup and Orasella cherry syrup over ice in a cocktail shaker until foam forms on top. Strain into a collins glass filled with fresh ice. Top with soda water. Garnish with a lemon slice and an Orasella cherry. Heat over medium heat, stirring often until well-incorporated and reduced by half. Pour into a non reactive jar and keep in the fridge up to 4 weeks. Wondering what to do with your leftover Orasella syrup? Make this three-ingredient recipe that’s sure to impress with minimal effort. The cardamom and white chocolate pair perfectly with our cherry flavored syrup. Bring the cream just to the boil with the cardamom pods, then set aside to infuse for 15 minutes. Melt white chocolate gently in a double boiler over barely simmering water. Place melted chocolate into an electric mixer fitted with the whisk attachment. Strain in the cream into the bowl of the electric mixer with the melted chocolate. Beat until the consistency of whipped cream. Spoon into pots, cover and chill for 4 hrs, or up to 2 days, until cold and set. Top with reserved Orasella syrup. This sweet little cocktail makes its way to our website just in time for the culmination of citrus season. It’s the perfect balance of fruit and port that will have you reaching for an additional pour. If you have leftover blood orange cordial, try serving it over ice with a generous pour of club soda to top. Lightly shake over ice and strain into a snifter glass or coupe. Garnish with a dried orange slice and Orasella cherry. Peel zest off of the blood oranges and lemons, avoiding the white pith and add to a large non-reactive container. Juice the zested fruit and combine with the orange juice, sugar, cardamom pods and ginger in a sauce pan. Heat over medium heat until the sugar is fully dissolved and reduce to approximately half the volume. Consume within a week.